Lee Min-jung is a famous actress from South Korea. She achieved her fame after her first lead role. She started her career with stage plays, and then got famous after appearing in some movies and TV series. Her popularity was gained after appearing in the romantic comedy Cyrano Agency in 2010. After that, she appeared in some dramas, such as ‘Smile, You’ (2009), ‘Cunning Single Lady’ (2014), and ‘Come Back Mister’ (2016). She also appeared in some music videos, such as ‘Like a Man’ by Fly to the Sky in 2006, ‘Girls Like Bad Boys’ by December and ‘I Don’t Care’ by 2NE1. Lee Min-jung was a late starter in the Korean entertainment industry, since she started her career at 25. She debuted after graduating from Sungkyunkwan University with a degree in Theater. She began her acting career at filmmaker Jang Jin’s stage plays. She has played in several theater performance like ‘Taxi Driver’ (2004) and ‘The Game of Love And Chance’ (2007). She also participated as cameo and minor roles in movies like ‘Wishing Stairs’ (2003), ‘Someone Special’ (2004) and ‘Wet Dreams 2’ (2005). In 2007, she appeared in the Christian-themed indie Pruning the Grapevine. She started to gain popularity when she played a supporting role in the widely popular series, ‘Boys Over Flowers.’ Although she was not the main character, she is quite popular and became well known. Her breakout role was in 2010 when she starred in a romantic comedy titled, ‘Cyrano Agency.’ She also earned some awards for that film. Since that film, she has starred in many commercials, and she gained a ‘goddess’ label since she became one of the most talked about celebrities in South Korea. In 2011, she starred in ‘Wonderful Radio’ which was a challenging role. She delivered the film successfully, and got a lot of praise and good comments from the critics and audiences. In 2018, she played on the SBS drama ‘Fate and Fury’. She reunited with her former co star from Cunning Single Lady (2014), Joo Sang Wook. Lee Min-jung’s maternal grandfather was Park No Soo, a painter who was an important figure in Korean art history. He led the first generation of modernized traditional Korean ink painters. 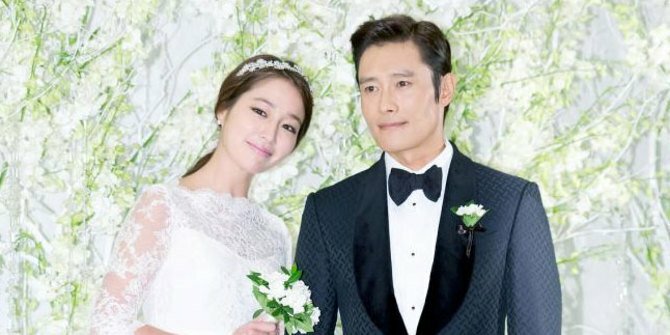 Lee Min-jung married Lee Byung Hun, a South Korea actor and model. They married on August 10, 2013 at the Grand Hyatt Seoul. They had been dating since 2006. Lee Min-jung and Lee Byung Hun also had their first child on 31 March 2015, named Lee Joon Hoo. Plastic surgery is a very common thing in South Korea. South Korea citizens accept their idols, whether he or she had a plastic surgery or not. Although the acceptance is high, but some South Korea public figure still hide their plastic surgeries to achieve their awesome looks. And today we will talk about whether Lee Min-jung had plastic surgery or not. First thing is Lee Min-jung’s lateral cantoplasthy. You can see in the ‘after’ picture that Lee Min-jung’s eyes seem wider and longer than in the ‘before’ picture. But, unlike some Korean actresses, Lee Min-jung did not get double eyelid surgery. Her eyes are still beautiful, anyway. The next plastic surgery of Lee Min-jung is nose surgery. We know that if we age, weight loss or gain does not significantly impact the nose tip. You can see in ‘before’ picture that her nose is quite short and big at the end, although she has nice nasal height for Asian. But in ‘after’ picture it is fixed with plastic surgery. Although she had plastic surgery, but there are not many references with ‘before’ and ‘after’ pictures. Lee Min-jung is famous for her beauty, even though she is 35 years old and has already gotten married, with one kid now. She is flawless and pretty even with natural make up. The key to get “honey skin” like Lee Min-jung is sheet mask. There are many sheet masks with variations of price and functions, but the sheet mask usually has a lot essences and vitamins that are good for the skin. It helps the skin appear to be brighter, and even reduces wrinkles. So, here is step by step to use skin mask rightly. First, wash your face with cleanser such as micellar water or make up remover, and then continue with face wash. Then, apply the toner to make your skin absorb the next step. Next, open your face mask and place it on your face. Don’t forget to use the excess essence in the mask. Leave the mask on your face for 20-30 minutes, then peel off the mask.